If your pockets are just beggin’ to be filled with an HTC Hero, your options thus far (assuming you’re in the US) have been limited. You could get one through Sprint or wait for Verizon’s Hero-esque Droid Eris – but either of those options means you’re on a modified, round-bodied Hero rather than the angled, chin-tastic Hero that nearly 70% of our readers prefer. You could import one of the original bodied Heros from the UK – but then you wouldn’t be able to get 3G on any US Carrier. If you wanted US 3G and an original Hero, you were out of luck – until now. 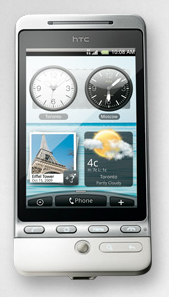 Earlier today, a new product page for the HTC Hero popped up. The good news: It’s an original-body Hero, and its got the 850/1900mhz UMTS bands required for 3G on AT&T. The bad news: It’s headed for Telus in Canada. There’s a really, really solid chance that you’ll be able to get one of these across the border and get it unlocked and running on an AT&T sim – but that means you’ve gotta deal with an importer and the (generally not too painful) unlocking process. But it’s totally worth it if that means you’re the only kid on the block with a burly-bodied, 3G-totin’ HTC Hero, right?